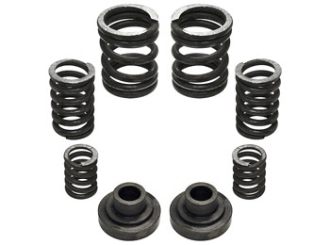 Governor Spring Kit for 1994-98 12v P7100 inj pumps or 4BT P7100 Injection Pumps. Kit is capable of making it a 3000gsk or 4000gsk....for 3000gsk, just don't install the 2 - smallest springs. 3000gsk = 1994-95 Inj pumps will rev to a min 2700rpm's before defueling under load or more depending on how tight you set the retainer nut. 4000gsk = 1994-95 Inj pumps will rev to a min 3800rpm's before defueling under load or more depending on how tight you set the retainer nut. Most towing applications etc will be happy with the 3000gsk set-up. We highly suggest installing HD valve springs on intake and exhaust valves if using the 4000gsk or 5000gsk.